You’ve just got yourself a new rifle scope, fitted it and let me guess…for some reason your shots are landing nowhere near the crosshairs? Sadly there’s more to rifle scope sharp shooting than just plonking the scope on the rifle and forever after shooting like an SAS sniper! You have to “zero” it. What Does “Zero a scope” mean? Zeroing a sight or scope means getting the crosshair in position so that when you shoot. Ground zero if you like. The point of impact.There’s a lot of discussion amongst shooters on the best way to zero a scope or sight. What I’ve written below is what I’ve been sending out to my eBay scope buyers for the last year or so and received a lot of good comments back about it so I know it’s OK! Tighten them into place using 1/2 turns at the time so that they sit solid and level as best as is possible, i.e., the downward pressure is as equal as possible. At this stage don’t tighten them fully as you might want to slide them up and down a little. Then put the top mount brackets on and tighten – Again use partial turns to tighten up. Don’t tighten fully at this stage, you may yet need to adjust a little. Adopt your standard prone/lie down shooting position. Prone is the best way as if you test shoot from standing or kneeling positions you waver more and it’s harder to do a “true test”. Put some sort of target in place at say 20 yards – or whatever you think your “standard” range will be. 2-3 shots is best as it will average out shooter inaccuracy and give you a more “significant” feel for how far or close you are from true zero. Now it’s time to use the windage and elevation turrets to get it zeroed dead on. 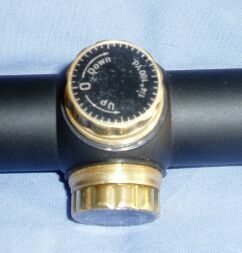 These are the 2 turrets on the top and right side of the scope. See my website for pictures. Models vary, you’ll probably screw a cap off and expose either a coin twist or finger knurled type of dial. If you have your scopes instructions they should have a table with figures to tell you what each click adjustment means in terms of cross hair movement at “x” distance, e.g., 1/8 inch at 100 metres. Use single click turns and each time take a new shot to gauge where the shot now falls – the dials basically adjust the cross hair position up-down and left-right. It’s trial and error basically but with testing you’ll get to where you need to be and be able to trust that your shots will go where it says they will! This may take some time and a lot of shots. Be patient!